Note: I don’t review substandard books. I read a lot, but I don’t have a lot of time to review books. What I share, I share because it’s the best of the best and I know it will help you in your quest to become an influencer. What would you do today if a positive outcome were guaranteed? Tags: Confidence, leadership, charisma, power, fear, action, faith, control, proactive. You’re often paralyzed by fear, afraid to make decisions and act. You want to be better looking. You want successful people to be attracted to you. You want a better job. You want to win at everything you do. You’re in any area of sales or marketing. I got turned on to Brian Tracy a few years ago when I read his book The Psychology of Selling. It was probably the first book on sales I ever read. Up until that point I was a reluctant salesman. That book changed my thinking about sales, transforming it from manipulation tactics to service. I was so impressed I began to read all his books, and this one became another favorite. Self-confidence is a powerful thing. The more experience I get in business and life, the more convinced I am that successful people are often confident first, and skilled second. You probably know someone who is completely inept in every way, and yet he or she is somehow successful, and the only thing you can see that they have going for them is that they’re confident. I’ve long noticed that confidence makes people more attractive. It literally makes people better looking. Trust me, I’ve seen a lot of short, fat guys with beautiful girlfriends or wives. What do all those guys have? Self-confidence. They know they’re short and fat, but they don’t care what anyone else thinks about it. “Yeah Josh, but it’s different for guys than for gals. Nobody likes a fat woman.” Are you so sure? I’m not convinced. Not even close. Other guys may disagree with me, because they don’t realize their eyesight is being distorted, but a large part of what makes a woman attractive is how she carries herself, not purely her appearance. Or I should say that her appearance is modified by how she carries herself. A woman who has confidence looks different than a woman who doesn’t have confidence. People who are self-confident attract successful people to them, speak better, get the good jobs, and effectively win in every area. I think they’re also happier–not because of the results they get from being self-confident, but simply because they’re not worrying about what everyone thinks about them all the time. They’re not nervous or anxious. They’re often more focused on others than they are on themselves, in fact, one of the best ways to build self-confidence is to be selfless and think about how you can serve others. Not only does it get your mind off your own faults and shortcomings, but as you serve others you’ll naturally gain a better sense of the value you bring to the world. 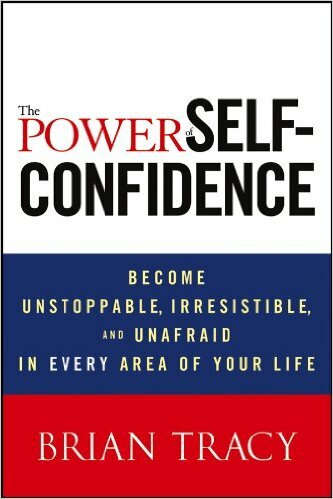 Tracy’s book is helpful both in terms of understanding the power of self-confidence, and understanding how to build it in yourself and others. My favorite question in the book is when he asks what you would do today if you knew the outcome were guaranteed. What would you do? Would you close that deal? Ask that girl out? Send that email? Make that phone call? Set up that meeting? Chances are, you’d behave differently, and by behaving differently you would encourage the outcome you want by being faster, doing a better job, and projecting confidence that would influence others. I love everything I’ve read of Brian Tracy’s books, but if I had to choose one to start with, this would be it. I’m confident you’ll love it as much as I did. Want to become an expert public speaker, writer, and marketing genius? These are the books that will take you there. Subscribe to my Influencer Inc newsletter, and never miss a review.